The active ingredient in Frontline Spray is called "fipronil." It kills fleas and ticks in cats and kittens, including deer ticks, the major carrier of Lyme disease. Fipronil works by killing newly hatched adult fleas before they have a chance to lay eggs. This breaks the flea life cycle and helps get rid of all fleas in all life stages. The active ingredient continues to work even if your cat gets wet or is exposed to sunlight. This product kills fleas shortly after the parasite comes into contact with your cat's skin. There's no need for it to bite your kitty for the active ingredient to work. It's effective and kills fleas and ticks for at least one month. These are the steps to properly apply this flea spray. The directions come directly from the manufacturer's instructions. Hold bottle in upright position. Ruffle the animal's coat with one hand while applying spray mist to the animal's back, sides, stomach, legs, shoulders, and neck. For head and eye area, spray Frontline on a gloved hand and rub gently into animal's hair. Approximately one to two pumps per pound of the animal's body weight will be required. Do not reapply the flea spray for 30 days. According to the product label at the manufacturer's web site, this insecticide can be used on kittens 8 weeks and older. But be cautious here. There appear to be some unexplainable discrepancies in the product labels. The manufacturer's web site says that Frontline Top Spot (with 9.7% of the active ingredient fipronil) should not be used on kittens under 12 weeks old. The label for Frontline Plus (with 9.8% fipronil and 11.8% methoprene) says that that it should not be used on kittens under 8 weeks old. Frontline Spray contains only 0.29% of the active ingredient fipronil. It's probably safest to consult your veterinarian when using any Frontline product on kittens, or use Advantage Flea Control, which is safe for kittens as young as 8 weeks old. According to the product label, "individual sensitivities, while rare, may occur after using any pesticide product for pets. If signs persist, or become more severe, consult a veterinarian immediately. Certain medications can interact with pesticides. Consult a veterinarian before using this product on medicated animals. Consult a veterinarian before using this product with other pesticides. This product may be harmful to debilitated, aged, pregnant, or nursing animals. Consult a veterinarian before using." These flea control products are now available without a prescription. 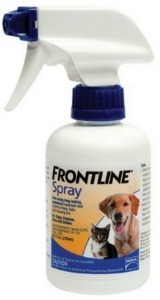 You can buy Frontline Spray in 250ml and 500ml bottles directly from many pet supplies stores and discount pet supplies stores online. Amazon carries all the popular over-the-counter flea medications at deeply discounted prices. Only Natural Pet Store is my #1 recommendation for safe, effective, natural flea control products. If you decide to go natural, this is the place to go.